Wearable Quadcopter: Is This Our Wearable Future? The Nixie is a wearable quadcopter that can take flight with a simple hand gesture, position itself to take a photo or video of you, and fly back to your wrist. 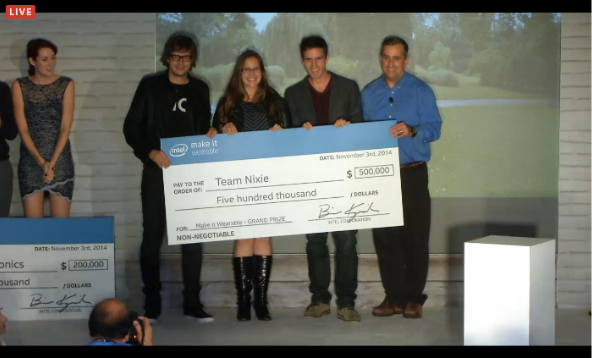 Team Nixie took 1st place in Intel’s Make It Wearable competition with a flying prototype, and will receive $500,000 to continue their endeavor. Kohstall has a background in rock climbing, so the Nixie was initially envisioned for use in outdoor adventure sports. However, during a video interview with CNBC Kohstall states “Nixie can be the next generation of point and shoot cameras”. This could change the way we look at photography all together. Aerial photography is becoming more popular and the Nixie’s self flying features can open the doors to even the most amateur user. The simple user interface can make it accessible to even the most novice tech users, such as children and grandparents. Prices are predicted to be “a bit more than a GoPro”, but no hard prices or dates have been set as of now. What does Nixie winning Intel’s Make It Wearable contest say about our society? A wearable drone is a fun and cool idea, but the runner up, Open Bionics – Low-Cost Robotic Hand, is focused on helping amputees by giving the gift of a low priced, nearly fully functional robotic limb. We are talking the beginnings of cyborgs! Is technology so mainstream (for lack of a better phrase) that we should focus our efforts, not to mention funding, on something to help us show off our Instagram-worthy adventures? Is getting a better selfie and auto-flying cameras the next big technology we should go after? I’m not so sure. Don’t get me wrong, I am a amateur photographer/filmmaker and love new and exciting gadgets to play with. But, how are innovating self flying drones helping technology and wearables get to the next level? Can we even classify this technology as wearable? I don’t know the answers, but I’m curious to see what comes from all of this.